You know those times when you explain things again & again (& again!) but your child isn’t taking it in? When your child becomes fixated on doing or having something that you just can’t do or give right then. And you get exasperated because you’re trying to be reasonable and find other ways to help the situation, but they just don’t care? My latest version of this scenario was after school this week when my 7 year old suddenly wanted to make a dog out of a sock. She found a video on YouTube & then a sock, and was wanting to follow the (somewhat complicated) instructions. I was making dinner. The toddler was wandering around pulling things out of bookcases as per usual. I didn’t have the capacity to help with the sock dog, but I offered to spend lots of time with her the next day on it. Which I explained to Emily again, and again, at an increasing volume (aka shouting!). After repeating myself about 5 million times, it was clear this approach was not working. We were locked in a heated question & answer cycle, on repeat. So I stopped explaining. And I stopped trying to solve the situation. I simply said – “I’m sorry I can’t help you today. I’d love to make it with you tomorrow, but not today.” When she became more upset, I moved in close to her & offered my love and understanding, saying “I know you really want to make it today. I’m sorry I can’t do it with you now”. I took the pressure off trying to fix it (because I couldn’t). She cried and said things such as “You NEVER do any craft with me.” “You’re ALWAYS busy” “You ONLY give George attention”. As much as I wanted to counter each of those statements with an explanation or a justification, now was not the time. This wasn’t a 2-way conversation! Emily was full of upset feelings and this was a great moment for her to release some of them. Justifying and reasoning would either have been pointless as she didn’t have the capacity to listen, or it would have interrupted the important release process and the feelings would have been repressed and stayed stuck. So instead, all I did was to stay as close to her as she would let me, and offer her my attention and empathy. After about 5-10 minutes, she stopped crying and could think straight again. We had a cuddle and made plans to have a ‘crafternoon’ another day after school. Then she happily played with George whilst waiting for dinner. 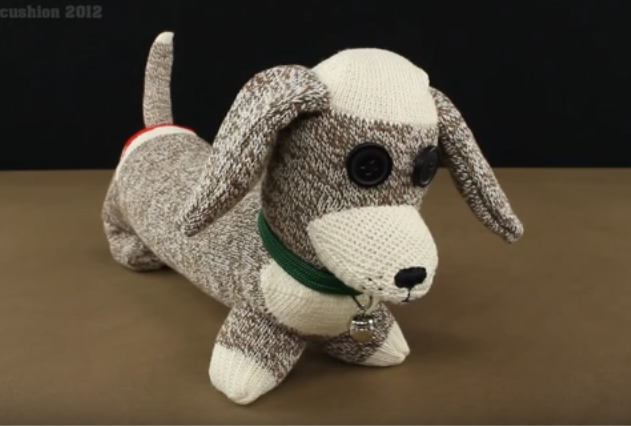 The whole upset wasn’t about making the sock dog (which is a huge relief because it does look complicated!). That was just the catalyst for her feelings, about something completely different, to flow. In this instance, it was about wanting to spend more one-on-one time with me as we’re either at after-school activities, with friends or I’m cooking dinner. It was a very clear reminder for me to schedule in Special Time with her again, as this had definitely fallen off my To Do list for quite a while. Special Time really offers our children that beautiful, loving attention they so need. It fills up their ’emotional cup’ and helps them be more resilient in dealing with everyday issues. It helps them FEEL connected with us, and likewise us to them. Without it, life feels harder as frustrations, anger and sadness builds up. And, likewise, giving our children that focused, loving attention when they are wildly (and seemingly irrationally) upset, allows for these upset feelings to pour out, so that they no longer need to carry them around any more. They can return to being their happy, relaxed selves. So the next time your child becomes fixated on something and is unreasonably demanding about something you’re unable to give them right then, it doesn’t need to turn into a ever-increasing shouting match where you’re both frustrated and angry with each other. If you can stop and recognise that constantly explaining the situation isn’t going to help, then it takes the pressure off you trying to fix it. And you can then offer your love and understanding so your child’s feelings can freely flow. Afterwards they will be able to think clearly again, and you’re both in a position to talk about it, negotiate, and come up with a great solution for both of you. When you’re in the cycle of exasperation and frustration, no-one thinks clearly and no-one wants to negotiate. As parents we can break that loop and provide the space for our children to offload their upset feelings so that mutual respect and understanding can be restored. It’s also a great sign that your child may need some Special Time. Children often behave in this way when they are carrying stressful feelings and/or they don’t feel as connected with us for some reason. Special Time builds that sense of connection, that space for you 2 to be together on their terms. And often that’s when the magic happens. To find out more about recognising what’s going on for your child and how you can help, join us at ANNOYING to AMAZING. Over 6 weeks, I’ll explain what’s going on when our children act out, and show you practical, loving ways to help them that will restore harmony to your relationship with your child, and your family as a whole. I’ll talk about lots of fun ways we can ‘discipline’ our kids, and how we can best look after ourselves so we don’t lose-it so much! It’s fun, useful and it’s immensely practical. CHECK IT OUT TODAY!